Passing the --color parameter to grep will make it highlight the portion of the line that matches the search expression, but it still only returns lines that contain the expression. Is there a way to get grep to output every line in the source file, but highlight the matches? If grep can't accomplish this, is there another command-line tool that offers the same functionality? I've fiddled with ack, but it doesn't seem to have an option for it either. What we're doing here is matching against the $ pattern and the test pattern, obviously $ doesn't have anything to colourize so only the test pattern gets color. The -E just turns on extended regex matching. Another way to do this properly and portably with grep (besides using two regexes with alternation as in the accepted answer) is via the null pattern (and respectively null string). Match using extended regular expressions. [...] A null ERE shall match every line. [...] A null string shall match every line. You can change the colors to anything you like (which might be hard with grep--I'm not sure) by changing the 1 and 31 and 43 (after \e[) to different values. The codes to use are all over the place, but here's a quick intro: the 1 bolds the text, the 31 makes it red, and the 43 gives a yellow background. 32 or 33 would be different colors, and 44 or 45 would be different backgrounds: you get the idea. You can even make it blink (with a 5) if you're so inclined. This doesn't use any special Perl modules, and Perl is nearly ubiquitous, so I would expect it to work just about anywhere. 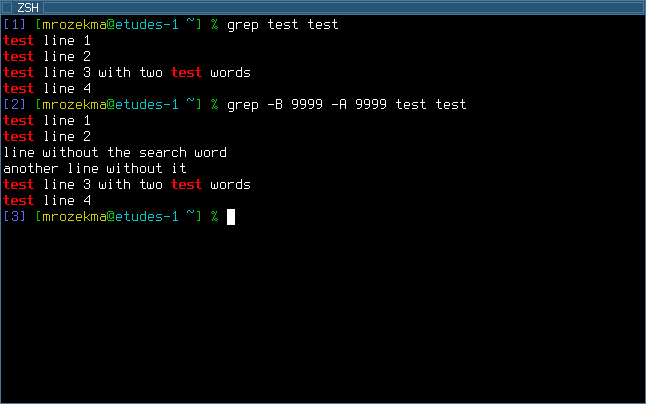 The grep solution is very clever, but the --color switch on grep is not available everywhere. For instance, I just tried this solution on a Solaris box running bash, and another running ksh, and my local Mac OS X machine running zsh. All worked just fine. Solaris choked on the grep --color solution, however. Since I don't think I've ever worked on a Unix box that didn't have Perl installed (with the exception of embedded-type systems, Linksys routers, and such) I'd say this is pretty much a universally useable solution. Also you can change the highlighting color if you like. Not very portable however, and even if Perl is installed, you may need to download another module. In addition it will color the entire line, not just the search word. It's one of the fastest grepping tools, since it's built on top of Rust's regex engine which uses finite automata, SIMD and aggressive literal optimizations to make searching very fast. --passthru - Print both matching and non-matching lines. Another way to achieve a similar effect is by modifying your pattern to match the empty string. For example, if you are searching using rg foo then using rg "^|foo" instead will emit every line in every file searched, but only occurrences of foo will be highlighted. This flag enables the same behavior without needing to modify the pattern. Credit goes to Cyrus's answer here. None of the answers given so far do provide a portable solution. 1 As long as your terminal supports ANSI colors escape sequences. A sed version, works on both bash and ash. Will paint main in red. cat testt.c | h main"
all work! :) Don't worry if you forget to close the quote, bash will remember you with a "continuing line character". Not the answer you're looking for? Browse other questions tagged grep highlighting or ask your own question. Linux how to highlight every occurrance of a word.